When he was born in Fonsagrada, Lugo, Galicia, Spain, he was baptized José María López Lledín, but he lost his name when he quit his job, let his hair and beard grow and began to wander around Havana, which he did for over fifty years. Dressed in French-style suit and coat, with no place to live but the streets of the city (which he baptized his “Dulcinea”), his appearance reminds us of Don Quixote—a French-Creole Quixote who was fed and looked after by the inhabitants of the city. And although he sometimes became the target of mockery and humiliation, there were always more people looking after him than trying to hurt him. But the Caballero de París was no beggar. He would write love letters for free for those who requested his services and give flowers to the ladies who would stop and talk with him. He always had a lucid phrase or verse that would amaze those aware of his condition. And he would not take what was offered to him without giving something in return—a paper fan, a torn page from some old book of poems, a pencil or a feather adorned with colored ribbons. Ever since he was admitted to the Psychiatric Hospital in 1977 because of his deteriorated health condition and after his death in 1895, Havana thought he had been lost forever. The statue is beautiful, but it’s just standing there, cold bronze. Now, however, you can get to meet him in the form of a living statue thanks to the amazing work of Andrés Enrique Pérez Viciedo, a Habanero whose story is just as romantic as the Caballero de París’s. The adventures of Andrés began at the age of 16 when he quit school. Pressed by his mother, he began to work at a large spinning mill. He would have stayed there, in anonymity, had he not overheard of an announcement to join a group of theater aficionados. And this is precisely what he became: a stage aficionado who had a long training period. But then came the day when he felt he needed more and found what he was looking for in Cuban stage actor and director Vicente Revuelta (founder of the emblematic company Teatro Estudio, which at one point in time was the best of Cuban theater). Under Vicente, Andrés told me, a new world opened up to him and he became a professional actior. But things were very unstable with Vicente, mainly due to his psychological disorder (and once more a halo of illustrious craziness surrounds this story) and Andrés found himself unemployed again. Then he took a crucial decision: to continue trying until he was 30—that would be his limit. If he hadn’t made a name for himself by then, he would give up the pursuit of art. When he failed to meet the deadline he had set for himself, he headed for a cigar factory to learn the craft of cigar rolling. And it was precisely then when he was asked to play a mute monk in a soap opera directed by a friend from his days of aficionado. The character already had the solemnity of the Caballero, whose spirit would seem to haunt Andrés forever. But fate took its time. Andrés joined Argos Teatro, one of Havana’s most renowned theater companies, directed by Carlos Celdrán, and a while later went back to working with Vicente. But when the company Giganterías was created under the auspices of the Office of the City Historian to fill the streets of Old Havana with color and music, he felt drawn by the company’s multifaceted work. The living statue thing came a bit later. There was no tradition in Cuba of this form of street art whatsoever, despite being so common in large cities. However, after a Colombian company introduced it in Havana back in the 1990s—although not for the street, but for the stage—this art form was introduced as part of Giganterías’ repertory. 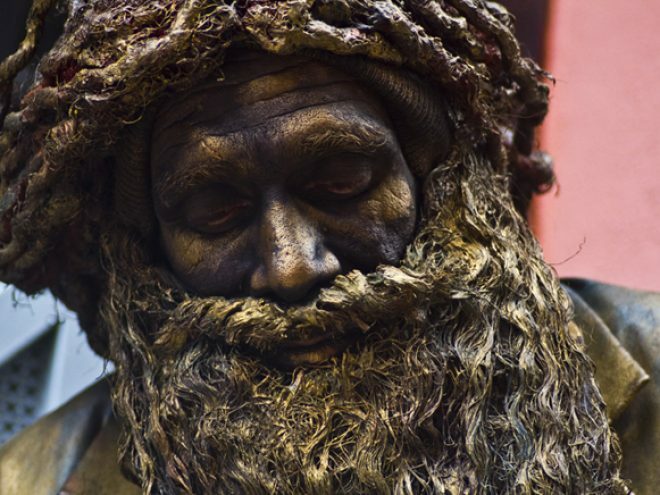 Today, living statues are part of the attractions Old Havana has to offer. There are statues of pirates, angels, old photographers in sepia, a piper, a mother and her baby. Their costumes and makeup imitate bronze, silver, clay. Most performers—professional actors who have undergone extensive training—take their characters very seriously and remain with their eyes closed, breathing imperceptibly until the sound of a coin magically wakes them up. Here in Havana, Andrés was the first actor to take the streets as a living statue. The figure of this 48-year-old man who has found a new lifestyle, employment and passion, has allowed him to transform, with little effort, into the legendary character of the Caballero de París. The Caballero de París (first José and now Andrés) makes a woman from overseas smile, and thanks her for the coin she has left in his bag by giving her a paper fan made of old newspapers. The woman, who is magically transformed by the charm of the moment into a fair lady of colonial times, keeps the fan close to her heart. Could this humble present possibly become one of her dearest souvenirs from her visit to Cuba? It makes you laugh and cry, all at once, seeing that touch of delirium in the eyes of the Caballero (now Andrés, first José) when, besieged by a group of adolescents, he comes out of his immobility and replies with a string of words of dark meaning in pure Castilian. Curious people applaud. Children follow him. He is easy to find. Everyone knows him. Don’t ask for José—obviously—or Andrés for that matter. When visiting Old Havana, ask any passerby for the Caballero de París. Offer him a coin. Take his gift. You will have met one of the most charming characters in this city. You will have met a living legend. Octuber 2014 This article formed part of the August 2014 issue of What’s On Havana The definitive monthly travel & culture guide to Havana Download our current issue of What’s On Havana, your definitive travel, culture and entertainment guide for all things happening in Havana, Cuba’s bustling and enigmatic capital city. We include features from around Cuba written by the best international travel writers covering Cuba. Our monthly online digital magazine is also available in Spanish and French.